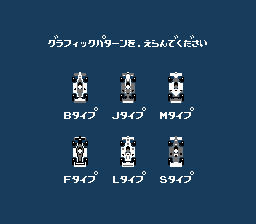 Family Circuit (ファミリーサーキット, Family Circuit?) 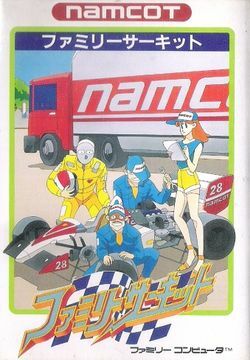 is a racing game designed by Masanobu Endoh (designer of Xevious), developed by his company Game Studio and published by Namco for the Famicom. 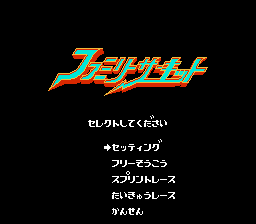 It was the first Famicom game published in 1988. It was never released outside of Japan, or translated into any other language. It is a simple racing game designed to be accessible to players of all skill levels. Rather than having to beat early skill levels and unlock better cars or more difficult race tracks, everything is immediately available to the player. The challenge of the game is to customize the cars so that they are well suited to take on opponents in four skill classes, and become a good enough player to compete in the highest class of racers. The game is portrayed from a top-down perspective. All race tracks start from the starting line, and continuously move upward along a curvy track until the starting line is crossed again. While the tracks are meant to be circular, the player never actually directs his car down on the screen, only up. Cars can never crash into one another, so it's possible to drive right through an opponent, although it's possible to crash into obstacles that are place just outside of the track. Each class has its own set of racers and tracks. Namco followed this version of the game up three years later with a graphically enhanced sequel known as Family Circuit '91, and another three years later with Super Family Circuit for the Super Famicom. It also remade the game for the TurboGrafx-16 as World Circuit. Settings is described below. Free Practice allows you to race on any one of 40 different tracks for as long as you like (use left and right to see more tracks). Sprint Race sees you attempt to win against eight competitors in four different ranks, Novice (four tracks, drivers are named after popular Namco games and characters), B Class (six tracks, drivers are named after Namco employees), A Class (ten tracks, drivers are named after Japan F3000 champions) and Super A (sixteen tracks, drivers are named after F1 world champions). Endurance Racing is a competition to see how can reach 1000 yards first on a single track. This is a very long mode of play, and while tire changes and refueling at pit stops are unlimited, it is important to manage the use of these carefully in order to prevent falling too far behind. Spectator mode allows you to pick a class, racers, and a track and either peg the camera to one particular car, or allow free movement of the camera while you watch the computer play through particular courses. This mode is best used to watch how the cars maneuver through one particular portion of the track, it isn't fast enough to follow the cars moving at top speed. You will then be given a six character code which you can input before each race to produce the car of your specifications. You may enter any code in at the time before a race, but the game will remember the code of the last car that you created so that you don't have to type it in. This page was last edited on 14 January 2012, at 01:12.